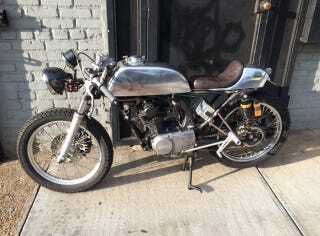 Our good friend Jeannette Klein, who you will recognize from Jalopnik’s What Car Should You Buy series and from the Classic Car Club Manhattan, had her custom Honda CB125 stolen. Maybe you can help find it. The motorcycle was stolen on Sunday evening around 6:30 p.m. out of Jeannette’s fiancee’s motorcycle shop at 93 Forrest Street in Brooklyn. The suspects were captured outside Tim’s shop via a security camera moments after the bike was reported stolen. One of the suspects was riding the motorcycle, while the other rode a bicycle pushing a second in his hand. The motorcycle was stolen without the custom front fairing as shown in the photograph above. The motorcycle was last seen Tuesday in a high-speed chase with the police near the Chauncey projects in Brooklyn, Jeannette told us. -New front and rear suspension, new brakes, new seat, new tank, new clip-ons, a custom battery box, rear sets from Loaded Gun Customs, quarter-turn throttle, Mikuni round slide carb, new tires, custom exhaust, and raw aluminum tins. Please contact Tim Harney (917)-292-3006 or Jeannette Klein (jeannettek@classiccarclub.com) directly with any additional information.